Playgrounds offer an avenue for the physical, social, cognitive and linguistic development of children. The City of Canada Bay aspires to ensure that all local families can comfortably walk to a neighbourhood playground within less than 10 minutes from their home. It was endorsed at Council's Meeting of 4 July not to proceed with a playground at the location which was consulted on. Council officers will investigate alternate locations and re-consult with the community. The pre-existing playground at Rothwell Park was removed due to the construction of a new amenities building at the western side of the park. The new playground is proposing to include new play equipment that caters to age 2-10 years old, wheelchair accessible mulch soft fall, shade structure and shade trees, and playground-friendly landscapes. The playground will be fenced, a seat and drinking fountain and a bin will also be provided. We encourage you to consult all the documentation available under 'Resources', particularly the Fact Sheet and Concept Plan. How has the new proposed location been identified? The new proposed location is conveniently positioned adjacent to Crane Street and will be fenced. The proposed location is already well shaded and does not impend on the adjacent sports field. When is it proposed to install a playground at Rothwell Park and how will this be funded? 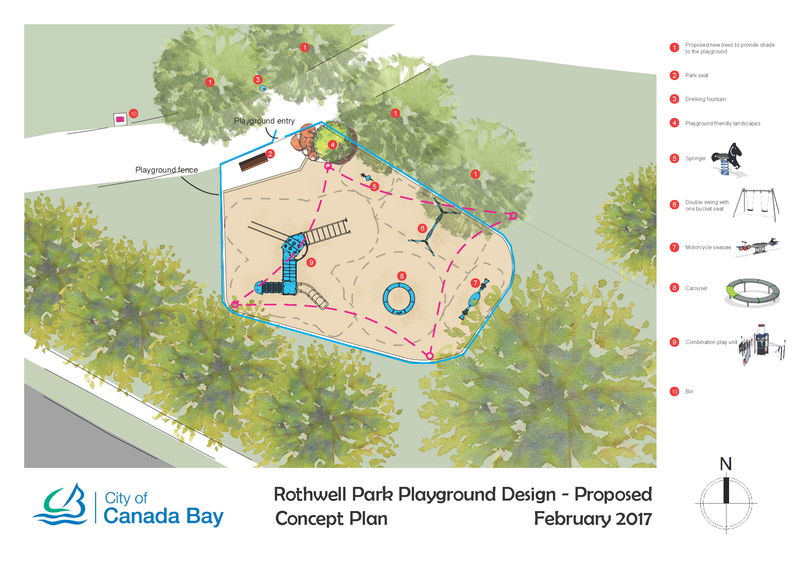 The proposed playground has been included in the City of Canada Bay’s 2017/2018 Capital Expenditure budget which is funded by s94 developer contributions. If the community supports the proposed playground, it will be installed during the course of this coming financial year. For a neighbourhood playground, construction is typically completed within two months.